The birthday party for Wayne’s daughter was going well. She was happy, and she should’ve been. The cake alone cost the entire weekend of overtime he pulled two weeks prior. His wife insisted. “You only turn four once,” she said. As far as he was concerned, you only live once, and his life was nothing but working to blow his money on a stupid party his daughter wouldn’t even remember. He’d already sold his boat to afford her birth. Not to mention proms, college, and someday a wedding. He wondered if a man could die from writing checks. 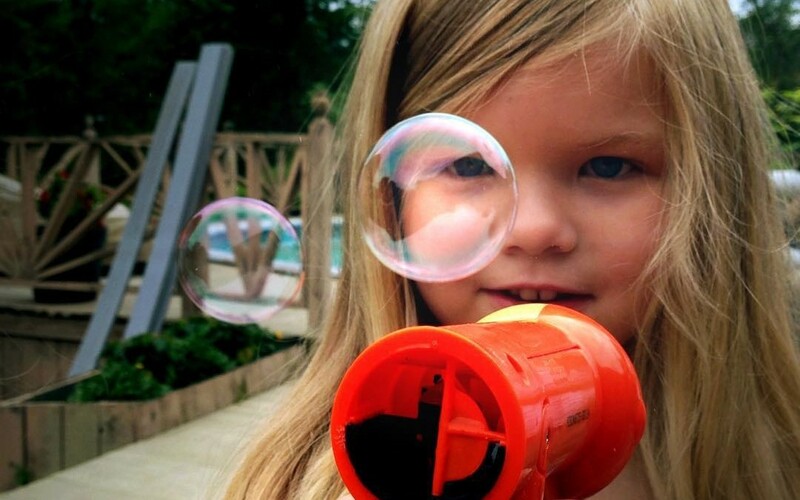 Wayne watched his daughter prance around with a bubble blowing gun. She didn’t care about the cake or the bouncy inflatables or even the presents—just the bubbles. They formed, floated upwards, and popped with the jab of a tiny four-year-old finger. A lifespan as fleeting and pointless as his paycheck’s. “Daddy! Bubbles,” she gleefully declared as she ran to him. “Yeah, Wendy. Bubbles,” he said unamused. She tugged at his arm. Wayne rolled his eyes and knelt to meet her face to face. She pulled the machine’s trigger, and a glossy new bubble materialized between them. But instead of seeing a distorted image of his daughter’s face on the other side, he saw an older version of himself inside the sphere. Playing forward like a projection in the bubble’s shimmer, he saw what he knew to be the future. But he didn’t see another boat or Super Bowl tickets. Instead, he saw himself teaching a teenage Wendy how to dance. The projection changed to show him staring into her empty room, after having dropped her off for her freshman year of college. Then, it revealed him walking her down an aisle, giving her away to another man. She kissed him on the cheek. The last projection was of him as an elderly man. A much older Wendy straightened a blanket over his shoulders, kissed him on the cheek, and said, “Look, Daddy. Our bubbles.” She dipped a plastic stick into a bottle and blew. Bubbles filled the image until a tiny finger popped the magical sphere. Wayne looked at his smiling daughter with tears in his eyes. “Daddy bubbles,” he said. You never cease to amaze. Fantastic as always. But this one is a step above. Thank you! I’m glad you enjoyed it! Thanks for reading! Thank you for the kind words! I’m glad you enjoy them!